We all want to see the finished product of a successful renovation project, or the shiny exterior and fine edges of a new structure. Ah, if only we could bottle that “new building” scent and put it into one of those hanging tree thingies. But the path to these construction achievements is fraught with danger. Ladders… scaffolds… heavy equipment…. Oh my! The list of potential pitfalls is practically endless. It helps to have a contractor that takes the right steps to prevent disaster. Commercial projects can often require workers to weld, paint and do other activities at greater heights. In those cases, scaffolding is an important part of the job. Unsafe scaffolding is often a top safety hazard reported by investigators for the Occupational Safety and Health Administration. Last year in Arizona, it was part of OSHA’s largest category for fines ($44,779 – fall protection). Make sure scaffolding is on solid footing; can handle its own weight plus four times the maximum proscribed load without buckling or moving; and has all of the rails from head to toe. Frequent inspections of scaffolding equipment and braces are a must. Similar precautions apply for ladders. Lift, push and pull properly. Sounds easy, doesn’t it? But ask any tradesman how his back feels. Be prepared to hang around for awhile until the story is finished. Construction work is hard work, and sometimes obvious steps of preventing strained muscles and backs can be lost in the shuffle of the job site. Remember to bend at the knees and lift by using your legs for help. Don’t turn or twist to the side; shift your feet and turn with your whole body. Pretend you are a robot (and last time we checked, robots did not report having any back problems). In addition, use the right tool for the job: An underpowered power tool can cause its user to push or pull to add extra force to the task. This can also create back and shoulder injuries. Have you ever seen a bunch of workers standing around a hole as its being filled in by a backhoe? Ever seen the backhoe driver’s face in that moment? It’s not pretty. The fascination of watching earth being moved is like when we first discovered fire; maybe it’s human nature. But it can create problems at a job site if workers don’t listen to the operators of heavy machinery. Listen up or ask if you’re too close in these cases, and while you’re at it, take note of the safety manuals for hazardous materials. These manuals — dubbed Material Safety Data Sheets (MSDS) — cover the ins and outs of each chemical at the construction site. They are on site at all times, and they are available in different languages. Hazard communication plans were the No. 1 most-cited problem at construction sites in Arizona last year, according to OSHA statistics. Proper signage for access areas and hazards are important, too. Finally, it never hurts to designate a “safety manager” for a construction site. Depending on the size of the project, you may need a few of them. But it’s better to have a proactive advocate for safety than to be reactive when a crisis occurs. In the Phoenix-Metro area, structures from the World War II era are as historically significant as Gettysburg. Thanks to the Valley’s early support for “urban renewal,” many of its best landmarks and most architecturally attractive buildings went under the knife for the Interstate 10 freeway Downtown and other modern projects. They’re not coming back, and now we’re clinging to the remnants. Since the 1960s, Americans have become increasingly attentive to historic preservation issues. The movement rose around the same time as the environmental movement, and with the establishment of national and local rules that foster and reward preservation, you too can own a piece of history. Update the structure’s electrical system. This can be costly, but it is worth it in the long run. It can help make the structure more energy efficient, and besides, you don’t want your historic gem spontaneously combusting faster than Jacko’s hair, do you? Overloaded wiring could pose a fire hazard that may torch your investment. This step is key to helping a historic structure become more energy efficient without ruining its historic character. There are several materials today that are synthetic yet have the same “look” as the original roofing materials, according to the National Trust for Historic Preservation. Consider your options, and make sure to factor in long-term durability, sustainability and aesthetics. Think twice before replacing windows. Old, single-pane windows can be a source of heat or cooling loss because they generally do not seal as tight or repel as much of the outside temperatures as newer windows. Unfortunately, these old beauties can be some of the key ingredients that may make your building historically significant. There are materials available, such as resins and weatherstripping, that can help make these old windows more energy efficient without having to replace them altogether. Make sure all painted surfaces have a fresh coat on them. A historic structure needs to be repainted every 10 to 12 years, according to Heimsath Architects or Austin, Texas. This can be pricey, but paint is an excellent preserving material to prevent wood from rotting or cracking. The structure’s western and southern exposures deserve special attention because ince they face the majority of the sun’s harsh rays during daylight hours. Stay true to the original design. Granite counter tops may not be what the original architect had in mind for your kitchen or break room, but the exterior was the supreme vision. Don’t erase it or alter it very much, because these original designs are essential to gaining approval for historic status or government incentive programs that can help defray taxes and project costs. Do your homework by consulting with your local historic preservation committee about the original architect. For national resources, visit the National Trust for Historic Preservation. For Arizona resources, visit the Arizona Historic Preservation Office, which is overseen by the State Parks Department. Do you have a historic preservation project? Contact Hernandez Companies and our building whisperers will help you get on the right path to save that historic charmer. Springtime is the peak season for light rail ridership as people cruise around car-less to some of the coolest spots in the downtown area. The next time you take METRO to that pub crawl, favorite restaurant, museum or outdoor event, take a moment to look around at the nearby buildings. Chances are good we’ve been there and worked our magic on the facade or infrastructure. • Central/Indian School station – Steele Indian School Park, site of the city’s annual Fourth of July fireworks display, its Veterans’ Day parade, and countless other public and private events sprawled out across 75 acres. It even has its own bird lake. • Central/McDowell station – Phoenix Art Museum, an institution since 1959 and a popular hangout for fans of progressive art and fashion shows from all inhabited continents, with more than 18,000 items; Burton Barr Library, a five-story architectural marvel that is the jewel of the city’s public library system and home to more than 700,000 items. • Central/Van Buren station – Orpheum Theater, a stunning example of Spanish Revival architecture that was built in 1929 and renovated by the City of Phoenix in 1996; St. Mary’s Basilica, a beautiful example of Spanish Colonial Revival architecture from 1924 with one of the largest concentrations of intricate stain glass windows in the Valley. Pope John Paul II stopped by in 1987. • Washington/Third Street station (Northwest-bound train) - Residents headed into Phoenix from the East Valley can see Hernandez Companies’ handiwork at two of the city’s coolest venues: the Phoenix Convention Center and Phoenix Symphony Hall. The former was expanded in 2008 and now includes more than 2 million square feet; the latter has been a Mecca for classical music fans – and helping keep Phoenix classy – since 1947. • East Phoenix/Tempe stations – Phoenix’s historic Tovrea Castle (1928) — the “wedding cake” building on the hill — is visible between the Washington/44th Street and the Washington/Priest Drive stations. 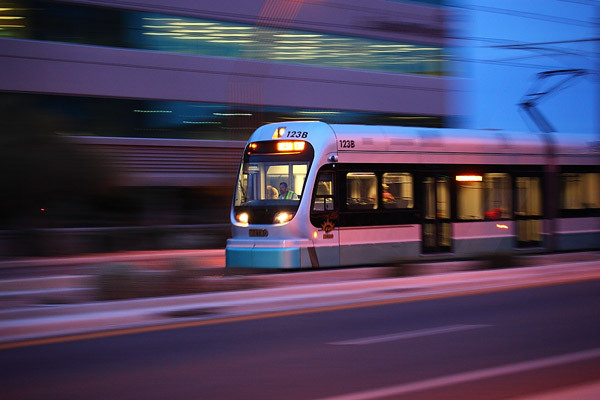 Most of the Tempe METRO stations serve students of Arizona State University, one of the largest public universities in the nation and a worksite for our building specialists. We’ve had the pleasure of working on these local landmarks over the 35-year history of Hernandez Companies so that they can bring you pleasure over the next 35 years. Enjoy! We like ambitious projects, thus the gutsy direction of this month’s column. As the old saying goes, “Anything worth doing is worth doing right,” so don’t procrastinate or cut corners with that next renovation project. If you’re tired of the sickly glow of those overhead fluorescent bulbs, consider changing them out in favor of LEDs or compact fluorescent bulbs (CFLs). Either bulb type will save you money on your electricity bill. Replacing traditional light bulbs isn’t a bad idea either: The federal government has passed new rules to start phasing out 100-watt incandescent bulbs in 2012, 75-watt bulbs in 2013 and 60- and 40-watt bulbs the following year, according to WIRED magazine. And here’s another tip: Try increasing the amount of space between each light fixture in the hall/corridor, then paint that space a brighter color. A Denver law firm tried this and saved 5 percent on its electric bill while keeping the same space bright. By the way, have you heard of “daylighting”? Several companies make rooftop devices that collect daylight and distribute it more effectively than skylights. They are very effective on sunny days (and we have a lot of those, don’t we? ), and they can cut up to 15 percent off your electricity bill while supplying the building with more natural lighting. If those fixtures are water-gulping monsters, switch them out in favor of low-flow versions. These include dual-flush or other high-efficiency toilets and faucets. Look for the “WaterSense” badge on the product. It denotes fixtures that are subject to a special program on water conservation that is overseen by the U.S. Environmental Protection Agency. One of these toilets, for example, can save 4,000 gallons of water each year. Multiply that by the number of toilets in a commercial building, and the retrofit makes financial (and environmental) sense. You can find a list of products here. Did your August A/C bill get you down? Consider starting a retrofit process that could ultimately save you more money than any other retrofit project, because this one is directly linked to our hot weather. Step 1: Order an energy audit of your building. You can do this through your utility provider: Arizona Public Service Co. (APS), for example, provides electricity to more than 1.1 million customers in the Phoenix-metro area and offers an affordable energy audit service using a pool of dozens of qualified contractors. These inspections can spot leaky windows or door frames that are allowing cool air to seep out, as well as faulty valves or shoddy duct work that keeps you from getting the most out of your HVAC system. Step 2: Once the problems are identified, start making the fixes. You can also use variable-speed fans; set a “dead band” on your thermostat that only activates heating/cooling when the temperature gets below or above a certain point; and replace any heating/cooling devices with new ones that feature the “Energy Star” badge. Step 3: Change the culture inside the office. Encourage staff or commercial tenants to be conscientious about their electricity use. If they’re on a company retreat or holiday, ask them to consider turning up the thermostat a bit during that time. Show your appreciation with a gift basket or gift cards for coffee. These are just a few ideas for a happier building. Watch next month for more tips from Hernandez Companies, your building experts. 1. Install water flow restrictors and aerators in sink faucets. Low Cost. 2. Install automatic room-lighting controls. These devices help optimize lighting use by automatically turning lights on or off, depending on occupancy or time of day. Low Cost. 3. Shade sun-exposed windows and building walls. In Arizona, direct sunlight streaming through windows at the wrong time of the year can substantially increase your air-conditioning costs. Low Cost. 4. Offer a small reward or other incentive for the employee who saves the most energy. The importance of getting employee cooperation shouldn’t be underestimated. No Cost. 5. Call Hernandez Companies for effective earth-wise recommendations and a free quote. No Cost.